A grand jewel of a hotel in Halifax, The Westin Nova Scotian brings together comfort and style as well as traditional elegance. A unique AAA/CAA Four Diamond hotel, The Westin Nova Scotian offers unmatched luxury accommodations for all sorts of guests, including those with four legs. The award-winning culinary staff provide delicious, quality meals for both in-house restaurants and in-room dining. The beauty and character of Halifax await just mere steps from this exceptional hotel. 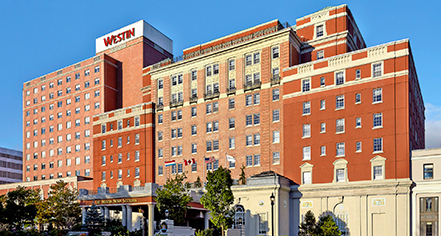 The Westin Nova Scotian, a charter member of Historic Hotels Worldwide since 2014, dates back to 1930. The hotel is one of the original railroad hotels owned by Canadian National Railways, which built landmark hotels all across Canada in the 1930s and 1940s. Airport Transportation: Available upon request; rates apply. Cancellation Policy: Guaranteed reservations must be cancelled by 4:00 p.m. on the day before arrival. Extra Person Fees: The charge for additional guests is $20 CAD per person. Occupancy Restrictions: No more than two guests are permitted to stay in a king guest room due to fire codes. No more than four guests are permitted to stay in a double/double guest room. Parking: On-site parking is available. Self-parking: Available; surcharge ($18 + tax CAD per night). Valet parking: Available; surcharge ($22 + tax CAD per night). Payment: Visa, MasterCard, Amex, Diners Club, Discover, and Cash are accepted. Pet Policy: Service animals allowed: Yes. Pets allowed: Yes. Amenities: Westin Heavenly® dog products Restrictions: Dog and Cat Friendly. Maximum size: Small. Smoking Policy: Guests may smoke outside. Should a guest smoke in their room, a room recovery fee of $200 CAD may be applied to their bill. 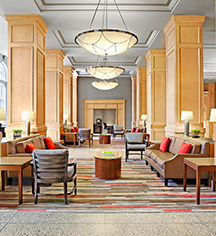 A grand jewel of a hotel in Halifax, The Westin Nova Scotian brings together comfort and style as well as traditional elegance. A unique AAA/CAA Four Diamond hotel, The Westin Nova Scotian offers unmatched luxury accommodations for all sorts of guests, including those with four legs. Learn more about the History of The Westin Nova Scotian .